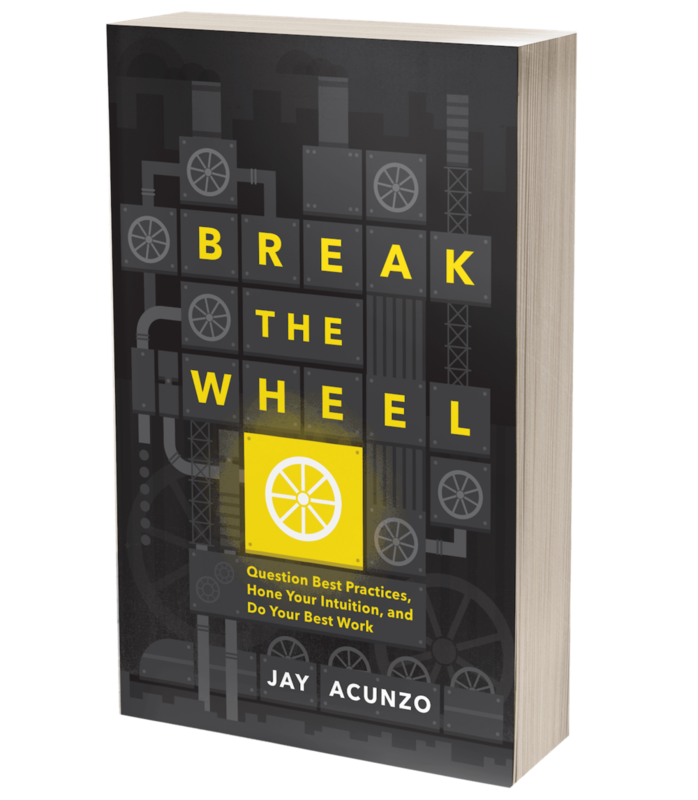 Worthy Or Not, Here I Come: The Cure for Imposter Syndrome — Jay Acunzo | Author. Speaker. Maker of Shows About Work. I don’t think I’m alone in struggling with these things, and since I addressed #1 last time, it’s time to tackle #2. What does it mean to do the work "your way" anyway? Isn’t that a scary and vulnerable place to be? What does it mean to be fully present? And, of course, why would anyone care that I did it my way? Am I worthy of their time, attention, and love? Imposter syndrome plagues a lot of us. But if I’m being honest — and, for once, I feel awkward about being honest — it’s never plagued me. Look, it’s not that I’m a single cell better than anyone who DOES feel imposter syndrome. It’s just that the nature of my work has REMOVED the issue entirely. This might sound surprising, given that I’m basically a business personality. What could cause imposter syndrome quite like that line of work? It’s all about ME, isn’t it? And that’s the issue. It can’t be all about me. It ISN’T all about me. I believe that to remove imposter syndrome — and, really, to do this creative stuff we all do WELL — we have to remove the self. You aren’t the work. You're the vessel for it. In Break the Wheel, I advocate for a simple switch in how we make decisions. Rather than act like experts, who have all the answers, I propose we act like investigators, who ask great questions. Whereas experts value absolutes, investigators value evidence. It might be helpful to know some generalized theory, but what really matters is asking question after question, finding clue after clue, as the case unfolds. Well, if you’re an investigator, then ultimately, your work isn’t about “who you are” but rather “what you’ve found.” You stop focusing on this implied notion of self-importance (“I AM something”) and begin focusing on your investigation (“I FOUND something”). When you’re investigator, it’s no longer YOU that must be worthy. It’s what you’ve uncovered. Anyone could have done it. You’re not special. But what you FOUND is. And that’s the work they came to see. With this simple mental switch, we can beat imposter syndrome. Why are we worthy? Who are we to earn their time, attention, and love? We’re the people who spent meaningful time asking important questions and investigating them thoroughly. We're here to present to them what we found. Let them judge away! They aren’t judging us. You’re judging what we found. We can then step back, away from that thing we found, and stand shoulder-to-shoulder with them to try and see it their way. We shouldn’t feel any more afraid or attacked than if we dug up a rock from the dirt and had someone point out what they see to be true about that rock. That’s not a comment on us. It’s a comment about what we found. Who we are still matters, but only so much as it informs our pathway to the work. The person you are is the trusty magnifying glass you can use during your investigation to see the world a certain way. But you still need to pull out that objective truth, and yes, put that truth out there for the world to see or judge. Ultimately, I think we're all just vessels. Like journalists or detectives, we’re on the case. We ask great questions, and we seek the truth in the world, through whatever we create. When someone exhibits imposter syndrome, they continually doubt their worthiness or authenticity, and they live with a persistent fear of being exposed as a “fraud.” When you’re an investigator, however, this seems silly. Fraud? As in, a fake? I don’t even see how that would be possible. How can you fake the fact that I embarked on an investigation? How can I fake this thing I found? I assure you, it’s quite real. In this era of insta-fame and Insta fame, we aren’t actually the stars of our work. That’s how I can avoid imposter syndrome even though I’m more or less building Jay, Inc. That’s how YOU can avoid imposter syndrome, regardless of what you do. They aren’t here to see us, nor are they really judging us. They want to know what we’ve learned. They’d like an update on our investigation. Work that’s worthy of their time and adoration isn’t created by handing others your answers. It requires that you ask great questions. Every individual alive is capable of doing that. Now open your word processor, turn on the microphone, start your design, take your camera on the road, start your company, go for that promotion, or walk through that curtain ... and give them what they REALLY came to see. It’s not who you are. It’s what you’ve found. This post was originally shared to my newsletter, Damn the Best Practices. You can subscribe below. Check email to confirm, and I’ll send you a little something right after. Posted on December 6, 2018 by Jay Acunzo.